Congratulations to the Booth Décor competition winner from the 2016 Atlanta MyShadi Bridal Expo – Sterling Décor by Kalpana Patel! A native of Ahmedabad, Gujarat, Kalpana Patel has been “living the American dream” for the past 30 years in Atlanta, Georgia. Patel, owner of Sterling Décor, has always been passionate about creating new designs, playing with colors, and helping people bring their visual design dreams to reality. 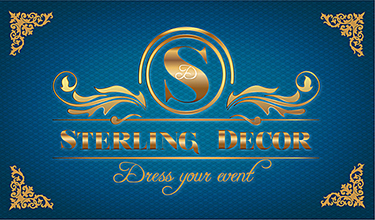 A full service event and wedding decorator, Sterling Décor has been serving the South Asian community in the Southeast for many years. Patel first began her décor business while working with her husband at their Indian grocery store they own, Bombay Bazar. While working in the gifts, artifacts, and traditional furniture in the store, she quickly realized her knack for creating new designs. She began purchasing new items for these sections, and soon shoppers were interested in renting the items for events. From that point on, Patel and her husband began purchasing even more decor from India, and combined with her passion for design and working with people, a new business was born. With the love and support of her husband, two daughters, and son, Patel has followed her passion and her desire to bring joy to those who seek her services. In this issue, we chatted with owner Kalpana Patel learn more about her background and the start of Sterling Décor. How does it feel to be the winner of the 2016 Atlanta MyShadi Bridal Expo Booth Decoration Competition? Winning is always a good feeling! This award brings us a feeling of satisfaction and achievement, especially since our work is being appreciated and loved by the Desh-Videsh team and attendees of the MyShadi Bridal Expo. What was the inspiration for the theme used to decorate your booth? 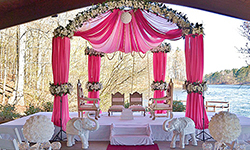 Roses were the inspiration for this mandap. We used rose-themed fabric, Indian pearl jewelry, and fresh roses to create an elegant, classic mandap design, known as our our rosette jewelry mandap. 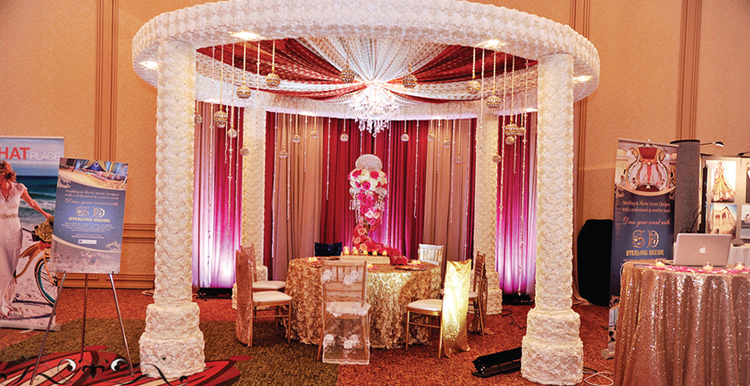 This mandap is made up of pearl white rosette fabric and decorated all around with pearl danglings. What are some of your favorite materials to use? We like to incorporate fresh flowers in our décor whether it be on the mandap, reception stage, or welcome Ganesh set up. My second favorite materials to use for draping our linen (lycra) and rosette – these are some of the best materials to work with! What services does your company provide? 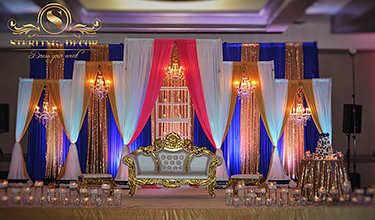 We design décor for any type of event – from graduation and sweet sixteen parties to engagements, arangetram, sangeet, mehndi, and wedding/reception décor. 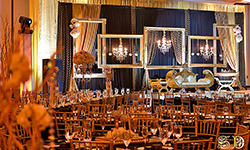 The décor is designed according to client needs, and their vision for their event. How do you and a new client work together to fulfill their vision for the wedding day or big event? We try and understand our clients needs by listening to them and understanding their ideas for a dream event. We try to get as detail information as we can for each of the events. What colors they prefer, if there is a specific theme for any of the events – these are important questions to ask. We work with clients as a team, and we ensure that our strive for perfection and hard work make our clients’ vision of the perfect wedding come true. In what regions do you provide your services? We work with clients in Georgia, Alabama, South Carolina, North Carolina and Florida. What has been your favorite wedding moment that stands out to you and why? 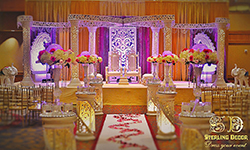 Our favorite moments always has been when the wedding mandap/reception décor is ready & ready for the bride & groom to view for first time at the venue while they come down for photo shoot. Their reaction when the doors are open to them & that look of happiness & amazing feeling that rushes on their faces. Their comments & thank you notes on our Facebook wall leaves pretty good feeling. Plan your event well in advance, ahead of time, location, and décor/theme. Get organizationally focused. Plan to have everything you need to create completed at least a month before the wedding. That’s when all the chaos will hit and you won’t be able to handle the time-sucking crafting projects. Don’t plan to do anything yourself on your wedding day. You’ll be busy getting beautiful. Make sure you’ve assigned everything to your event planner, friends and family who are assisting you. And confirm it again a week ahead and the day before the wedding.